Hello! I hope you all had a wonderful Thanksgiving holiday. I know that we certainly enjoyed ourselves. Thanksgiving is always a holiday that I enjoy because it is so much less about the material things than many other holidays are. At least in my family, the Thanksgiving tradition has always just been that you get together with people you love and eat a delicious meal. However, that doesn’t mean that there aren’t any ways to simplify your Thanksgiving feast. My main simplification goal with Thanksgiving this year was to not get too overwhelmed with leftovers. The first step I took in doing this was setting a very strict menu and sticking to it. 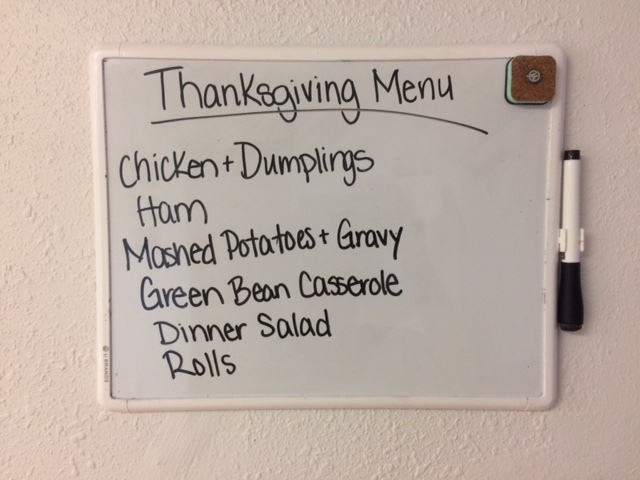 After I created the menu and had a headcount for our dinner (we hosted a little “Friendsgiving” at our house), I started doing a little mathematical reasoning to decide how much of each thing I needed. The one thing I was worried about having too much of was meat. My husband’s family tradition is to make homemade chicken and dumplings every year, so he knew he wanted that. I’d also picked up a small ham though the last time I was in Anchorage and he was dying to cook it up to have for lunches. We ended up cooking both, which made me very thankful that I’d only bought a 2.5lb ham. Pretty much everything else we ate was bought at our big once a year shopping trip last summer, so we were also able to cook up our feast without spending an arm and a leg. 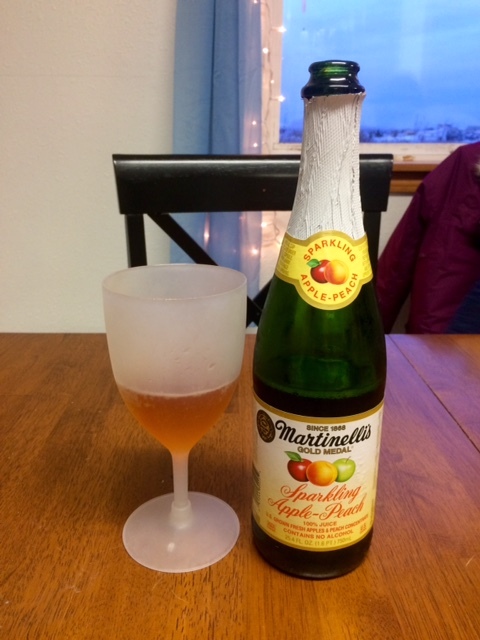 The one splurge I did make was sparkling cider. Somehow, miraculously, our teensy Bush store had managed to order a handful of bottles. The $10 price tag didn’t even deter me from buying a bottle. After being pregnant for the last five months and drinking pretty much nothing but water, it was necessary. After the feast, I started looking for leftover ideas. We always do simple plates of leftovers where we warm everything up, and Cody always likes to slice up the leftover turkey or ham for sandwiches. I wanted to spice things up a bit this year though so we didn’t get burnt out or end up throwing away much. The biggest hit was omelets with biscuits and gravy. We just diced up leftover ham, salad fixings, potatoes, and whatever else we had that could go into them. 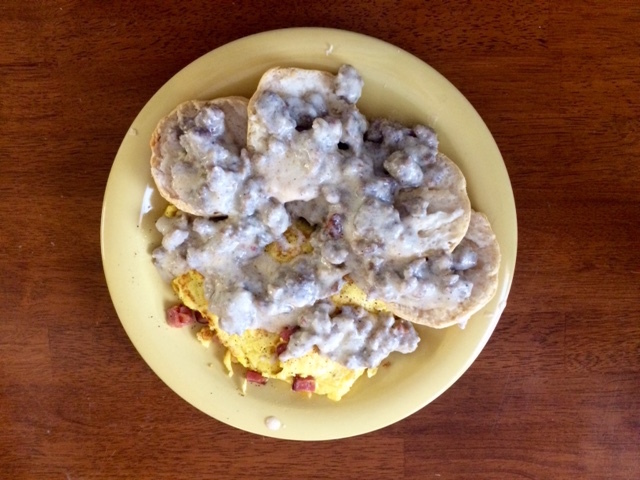 We used leftover dinner rolls for the biscuits too, so all we really had to make was the gravy and the eggs. 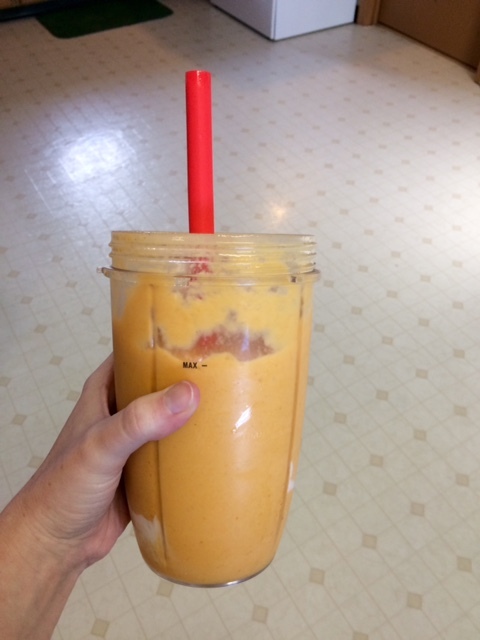 Another of my favorites was pumpkin pie smoothies. You can use leftover pumpkin pie puree to make some pretty tasty concoctions. I made smoothies using the puree, greek yogurt, frozen bananas, maple syrup, ice, and almond milk. It was delicious! Other ideas that we tried this year, or have tried in the past are: pot pies, creamy stew/soup, grilled ham/turkey and cheese sandwiches, and frittatas or quiche. We also froze the leftover broth from making the homemade chicken and dumplings to use for soups later this winter. There are so many options out there and with easy internet access you can check out a million different articles about how to make things like cranberry-stuffed muffins or leftover turkey chili. All of these great options available online will hopefully make it easier for people to start limiting their food waste during the holiday season (and even all year round!). This entry was posted in Food Waste, Simple Year Six. Bookmark the permalink.